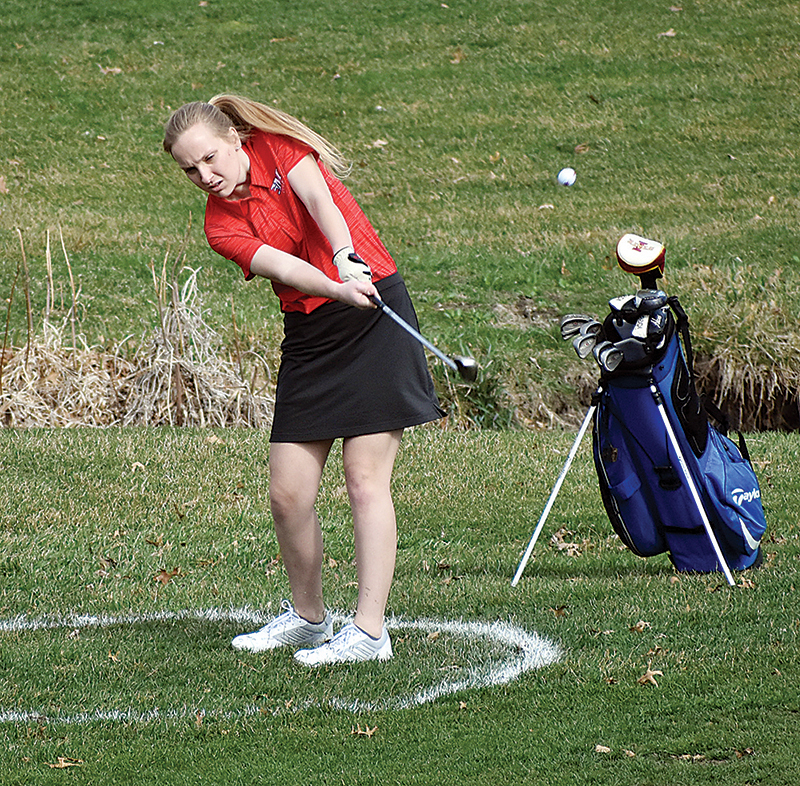 T-R PHOTO BY THORN COMPTON - Marshalltown freshman Amber Henson chips onto the second green at the American Legion Memorial Golf Course on Tuesday during the Bobcats’ season-opening dual against Waukee. Henson was the meet medalist with a 3-over-par 39 but Marshalltown lost to the Warriors, 192-196. 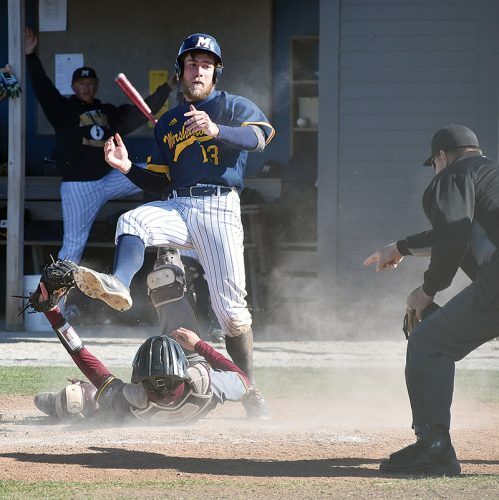 Typically the first varsity competition for a high school player comes with quite a few nerves that throw off a performance, particularly for a freshman. 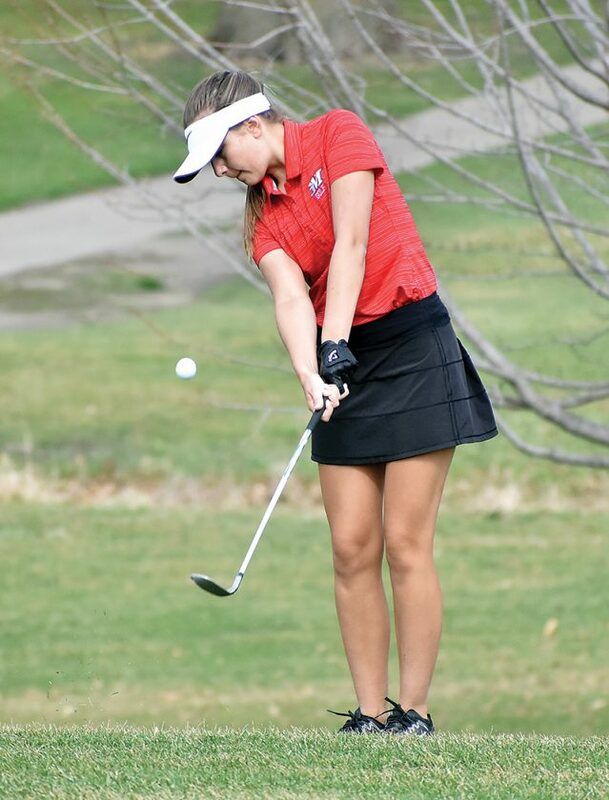 Don’t tell that to Marshalltown freshman Amber Henson though, as she made a huge splash in her debut for the Bobcats by taking medalist in the season-opening dual against Waukee with a 3-over 39 at the American Legion Memorial Golf Course. MHS head golf coach Lucas Johnson said Henson looked every bit the part of a No. 1 golfer on Tuesday against the Warriors. While Henson was the medalist it wasn’t quite enough to put the team over the edge. 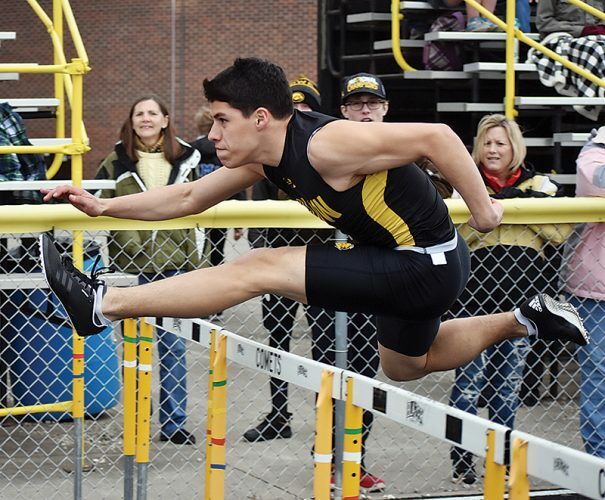 The Bobcats finished four strokes behind the defending Class 4A state champions, 192-196, but even with the opening loss to a CIML Iowa Conference foe, Johnson said given where he was expecting the team to start this was a great showing. T-R PHOTO BY THORN COMPTON - Marshalltown freshman Norah Wilson tees off on the third tee box at the American Legion Memorial Golf Course on Tuesday in the Bobcats’ season-opening loss to Waukee. Sophomore Kyra Feldman was second on the team with a 50, which was just over her nine-hole average a season ago. Henson was the meet medalist by eight strokes, with Waukee’s Jessey Wyzgowski finishing as the runner-up with a 47. Johnson said Henson had only 13 putts on the front nine of the Legion, and that was partly because of the work she put in during her own time. Junior Taylor Naughton was next up with a 53, and that was 14-strokes better than her season-best score from a year ago. Rounding out the counting scores was another freshman, as Brynn Van Buren shot a 54 in her first meet. Junior Emma Younkin and freshman Norah Wilson were both close behind with both shooting a 55, and Johnson said his girls are in a good position right now. After Wyzgowski’s 47, Elle Kramer and Megan Seiler had a 48 for Waukee and Emalee Andrews rounded out the counting scores with a 49. With such a strong debut for the team in general and for Henson specifically, Johnson said there’s a lot of excitement about the rest of the season but as the schedule progresses he looks forward to seeing the way his girls fight through adversity. 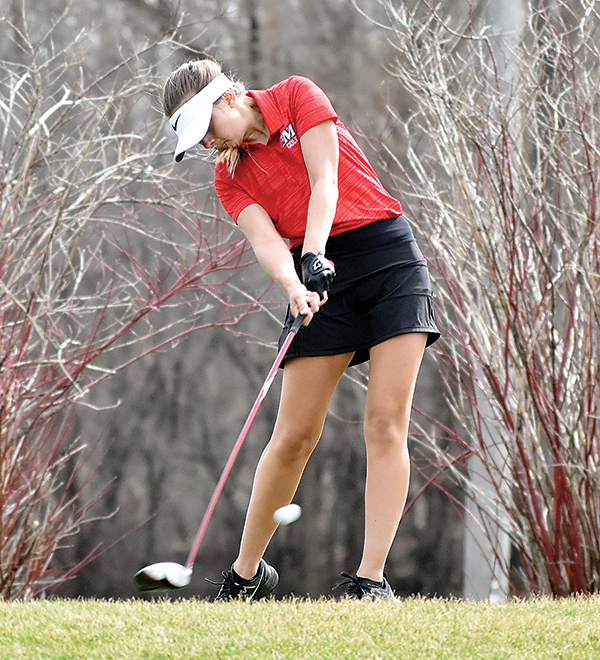 Marshalltown next hits the links on Monday at Willow Creek Golf Course for the West Des Moines Valley Invite, starting at 10 a.m.
Medalist — Amber Henson, MHS, 39; Runner-up — Jessey Wyzgowski, Waukee, 47. WAUKEE (192) — Wyzgowski 47, Elle Kramer 48, Megan Seiler 48, Emalee Andrews 49, Mary McLaughlin 49, Meghan Doherty 50. MHS (196) — Henson 39, Kyra Feldman 50, Taylor Naughton 53, Brynn Van Buren 54, Emma Younkin 55, Norah Wilson 55. 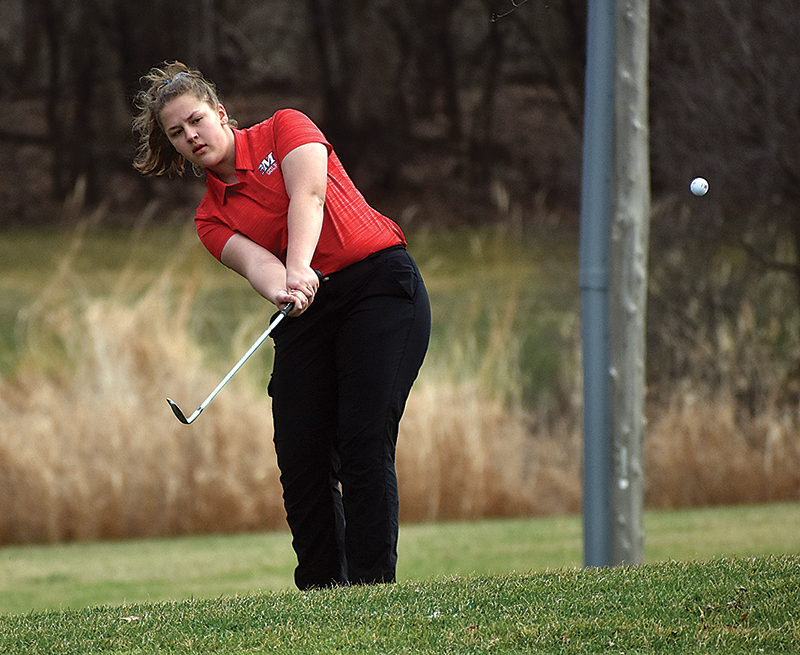 T-R PHOTO BY THORN COMPTON – Marshalltown freshman Amber Henson chips onto the second green at the American Legion Memorial Golf Course on Tuesday during the Bobcats’ season-opening dual against Waukee. Henson was the meet medalist with a 3-over-par 39 but Marshalltown lost to the Warriors, 192-196. 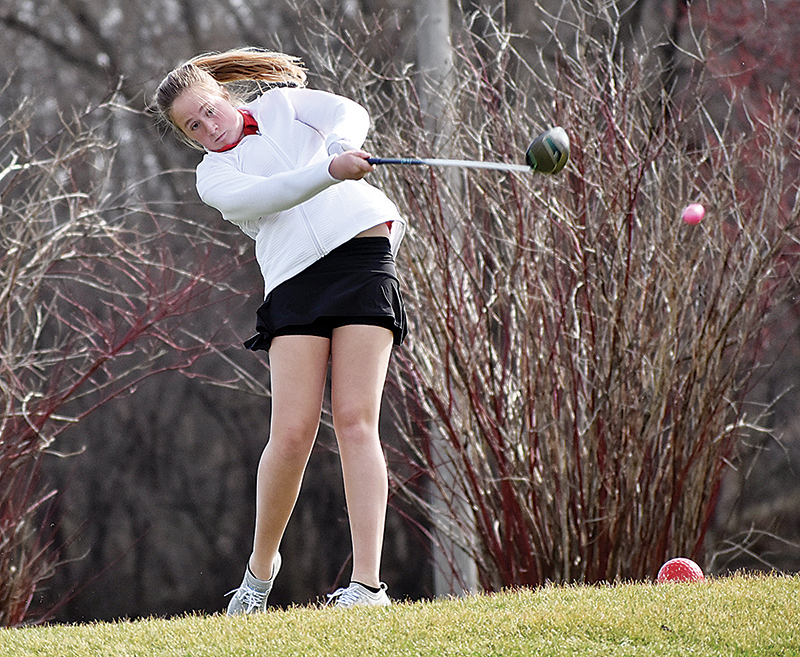 T-R PHOTO BY THORN COMPTON – Marshalltown freshman Norah Wilson tees off on the third tee box at the American Legion Memorial Golf Course on Tuesday in the Bobcats’ season-opening loss to Waukee. T-R PHOTO BY THORN COMPTON – Marshalltown junior Madi Finch makes a running forehanded strike at the ball during a doubles match in the Bobcats’ meet win over Des Moines Lincoln on Tuesday. Finch swept her singles match, while she and Olivia Brintnall were winners at No. 2 doubles. T-R PHOTO BY THORN COMPTON – Marshalltown senior Hel Ter hits makes a forehanded hit on the ball during the singles matches in the Bobcats’ 11-0 sweep of Des Moines Lincoln on Tuesday in Marshalltown.